The Lady Eagles battled it out with Muskegon Western Michigan Christian (WMC), to come out victorious with a score of 3-0 and claim the title of regional champs on November 14 at home. 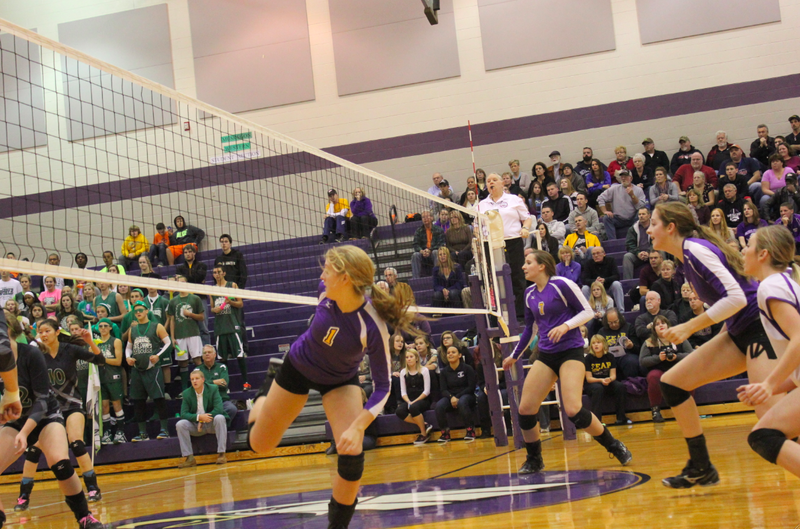 “It is a really awesome feeling going from KVA champs to district champs to regional champs. And no matter what happens from here on out we all still have that to hold on to,” said Jayci Suseland, Schoolcraft high school freshman. Schoolcraft worked hard through out the match. They ended their first game 25-19. Once Schoolcraft hit 19-15 during the second game, the rest of the contest went smoothly, leading then to finish strong. The third game ended in 25-21. Schoolcraft Varsity coach Erin Onken said, “The girls have heart, they are determined, and they play for each other.” Onken says that she’s confident in the girls as she’s with them everyday and sees just what they can accomplish. When it comes to playing against these very talented teams like WMC, it takes a lot to get through the games. There are so many things that motivate these players; Miranda McDonald said her coach motivates her with inspirational quotes. While Jayci Suseland says the student section motivates her, “Trust me, we can all hear them cheering for us.” However, it’s Kathryn Ingle who feels it’s her team that pushes her, Ingles said, “My team is what motivates me, they are all so amazing and wonderful. We all push each other every day. At practice or in a game we push each other and make each other better. The Schoolcraft Eagles will play Mendon at Delton Kellogg High School on Tuesday, Nov. 19th at 6:00 p.m.